I am no expert on Southwest cuisine because I live in the Southeast, but these nachos are good no matter where you live! The beauty of them is you can add any toppings you like or leave off the ones you don’t like and everyone is happy. Just put the toppings out and let everyone choose. Double or triple this recipe and serve at your next casual party. Tear off 4 -12 inch pieces of aluminum foil and roll edges up to form a shallow dish. 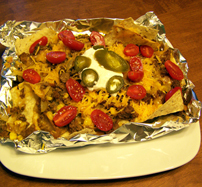 Place foil dishes on baking sheet and cover the bottom of each with a layer of tortilla chips. Set aside. In a large skillet, cook ground beef and onion until meat is no longer pink. Drain excess fat from the pan. Add corn taco seasoning mix, water, and green chilies. Continue to cook a few minutes longer (about 3 to 5 min) until some of the liquid has evaporated. Spoon Meat mixture over chips and dot with refried beans. Bake for 8-10 minutes or until chips and refried beans are hot. Remove from oven and sprinkle with cheese. Serve on a plate and let everyone pick their favorite toppings. Serves 4. * Lighten up this recipe by using ground turkey instead of ground beef. Use light cheese, sour cream and non fat refried beans to save more calories.